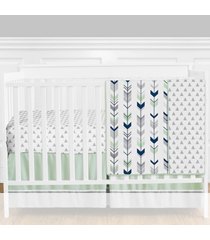 Welcome to the Bumperless Baby Bedding and Bumperless Crib Bedding section of Beyond Bedding! Along with our gorgeous baby collections we also carry many Toddler Bedding and Teen Bedding sets to outfit any bedroom. To complete your decorating scheme, we have dozens of matching bedroom accessories to complement each theme of baby bedding and crib bedding. Whether you are searching for baby boy bedding or baby girl bedding, you will have no problem finding something to love at Beyond Bedding. Every set is hand designed and produced by the popular brand Sweet Jojo Designs, so you are guaranteed to find affordable luxury for your baby nursery. 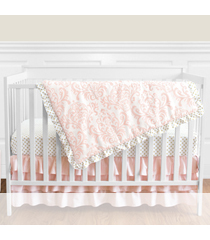 We not only have beautiful pink and brown, polka dot, and western crib sets, but we also proudly offer adorable Childrens Bedding sets in themes that perfectly match our baby bedding designs.